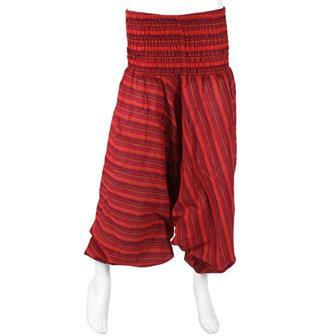 Here is our selection of comfortable Fair Trade Harem and Ali Baba trousers in a huge variety of colours and patterns from around the globe. Perfect for lounging, these styles of drop crotch trousers are perhaps the most comfy items of clothing you will ever own! Brilliantly bright and curiously colourful, these great Kantha material trousers have comfortable elasticated waists, a baggy style and are each handmade in India. 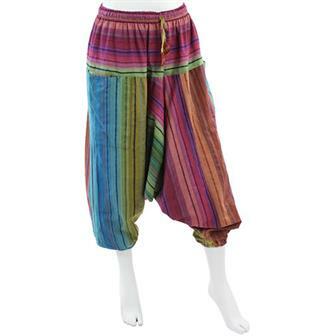 These super comfy Ali Baba trousers are hand tie dyed in a single colour tone. Great for relaxing into a chilled out, casual look. 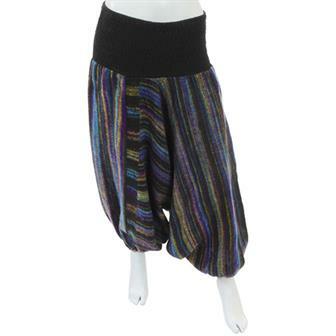 Perfect to wear with a plain vest top and ideal for festival goers or yoga enthusiasts. These trousers have a low crotch and elasticated waist. 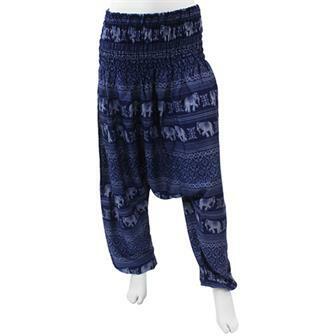 Super comfy baggy cotton harem trousers with elasticated waist and ankles. 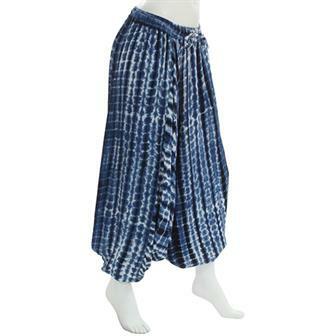 Each pair has a spacious leg pocket made of delightfully intricate Thai weaving and a drawstring waist tie for support. Ideal for day to day lounging or relaxing exercise. These supremely comfortable trousers are made from warm acrylic blanket material, perfect for those chilly nights. 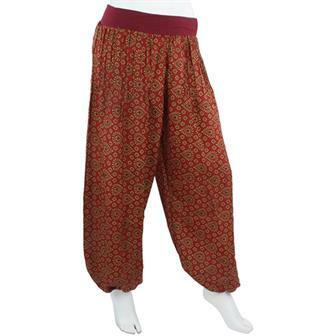 Made from the colourful traditional Indian bedspread material, these ali baba style trousers are super comfortable and easy to wear. 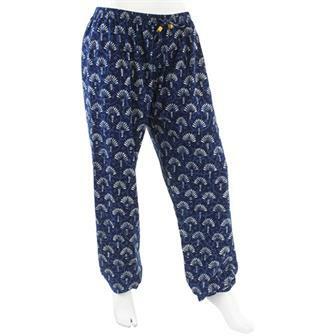 These baggy, comfortable trousers are printed with an eye-catching elephant print design. Made from 100% lightweight cotton, they are perfect holiday wear. Made from sensuously soft sari material, these beautiful lightweight trousers are perfect for keeping cool on even the balmiest days of summer. The trousers come in a huge array of mixed fabric styles and feature an elasticated cotton waistline and trouser cuffs for added comfort. Fabric colours and patterns will vary. 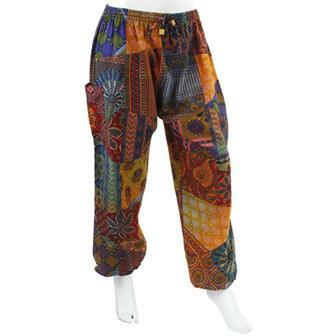 These comfortable and easy going hareem trousers are part of our exciting range of Nature's Dye clothing. Handmade in India, these great items use only natural dyes to create beautiful, eye catching patterns. Dyed in two different gradients of vivid colour and printed with intricate little flowery mandalas, these super comfy harem trousers have an elasticated waist and ankles and deep side pockets. 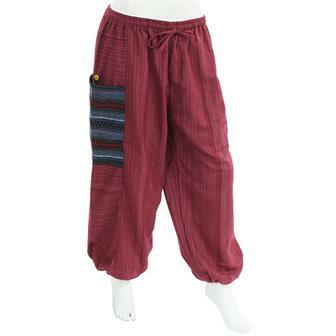 These comfortable, solid colour, cotton harem trousers are completed stylishly with a sash of colourful stripy cotton material. 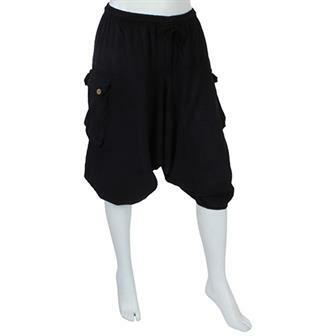 These incredibly comfortable lightweight Ali Baba style shorts are made from soft cotton and they feature an elasticated waist for comfort. A perfect piece of lounge-wear, they come in simple black for hot summer days and have two large pockets. 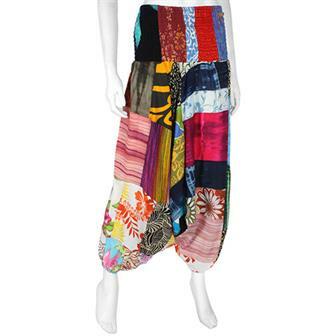 Powerful pair of patchwork Ali Baba trousers made from a unique quilt of printed cotton squares, formed into this comfortable flowing garment with elasticated waist and ankle hems, generous pockets and drawstring tie. Bring on Summer! 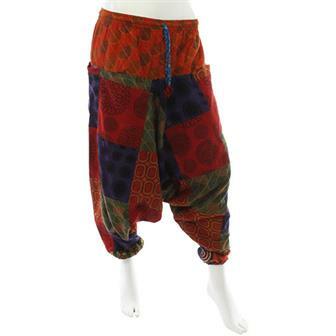 These supremely comfortable Ali Baba style baggy trousers are made with a wide elasticated waist, a very low crotch and ankle hem elastic making them the ultimate in lounging, festivaling or yoga wear. Each pair is very lightweight and very versatile, they can even be pulled right up to double up as a jumpsuit. Lightweight and baggy, these comfortable hareem trousers have an elasticated waist and are great for everything from yoga to the beach; from stomping around a summer festival to lounging around on the sofa. 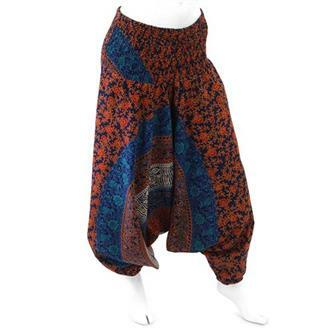 Great for chilling out in, these attractively printed harem trousers are incredibly comfortable because of their drop crotch style and elasticated waist. 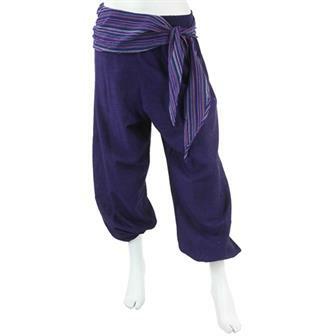 With their low drop crotch and elasticated waist and ankles, our colourful Thai Hmong style Ali Baba trousers are made for both style and comfort. 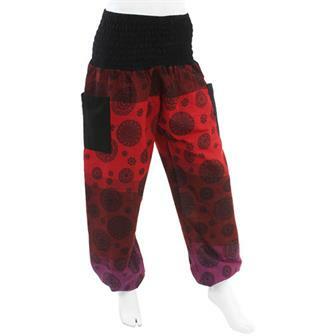 These wonderfully comfortable harem trousers have a drop crotch and an elasticated waist making them perfect for lounging or for stretching out on the yoga mat. These supremely comfortable trousers feature an elasticated waist and a very low drop crotch making them perfect for yoga or for general lounging! 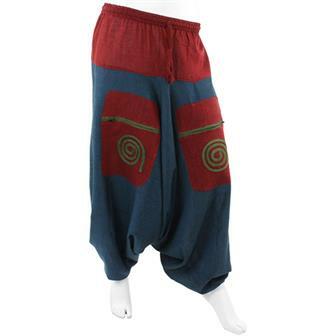 They are decorated with embroidered swirl patterns on the two thigh pockets. 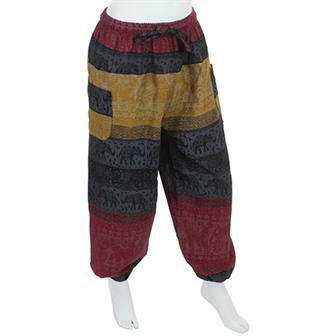 Featuring our popular block printed shyama style, these comfortable Ali Baba trousers have an elasticated waist and leg cuffs and a drop crotch for total comfort. Made in a rich patchwork of different stripy materials, these casual, loose fitting trousers make excellent lounging pants.